Kelsey & Steven’s wedding at the Clark Gardens in Weatherford TX is one of my favorite tented weddings we have been a part of! I first met Kelsey at Starbucks in Fort Worth, and I was quickly inspired by her overall vision for her big day. When she called to tell me she would love for me to be her planner, I literally did a happy dance inside because I knew not only would she be so much fun to work with, but also it was going to be gorgeous! Kelsey & Stevens’s one requirement when looking for their wedding venue was that they wanted an outdoor wedding. Once we visited Clark Gardens, they knew it was the one. 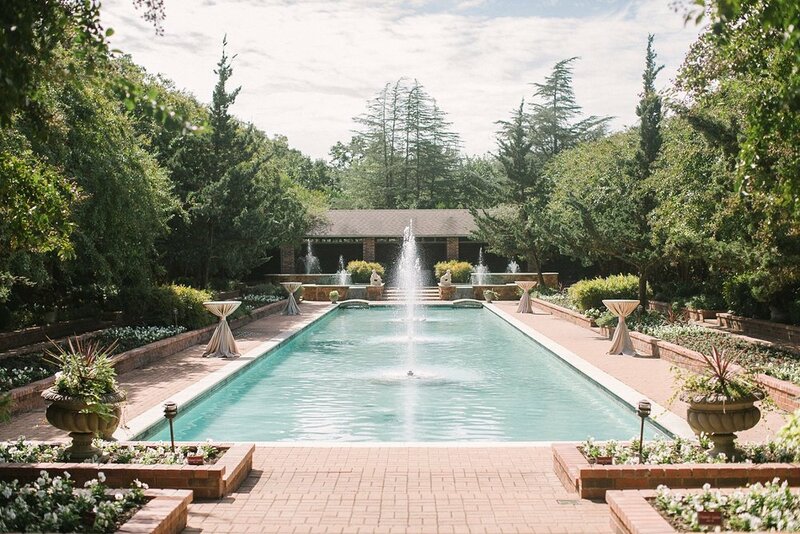 From the large water fountain at its entrance to the greenery tunnels throughout the gardens, and the many other hidden gems throughout the venue they knew it would be the perfect backdrop for their big day. Kelsey & Steven got married on the bowling greens of Clark Gardens, that was located right next to their reception. We honestly could not have asked for a better day for them to get married. The altar was a large archway filled with greenery and white florals, and low organic florals lined the aisle. 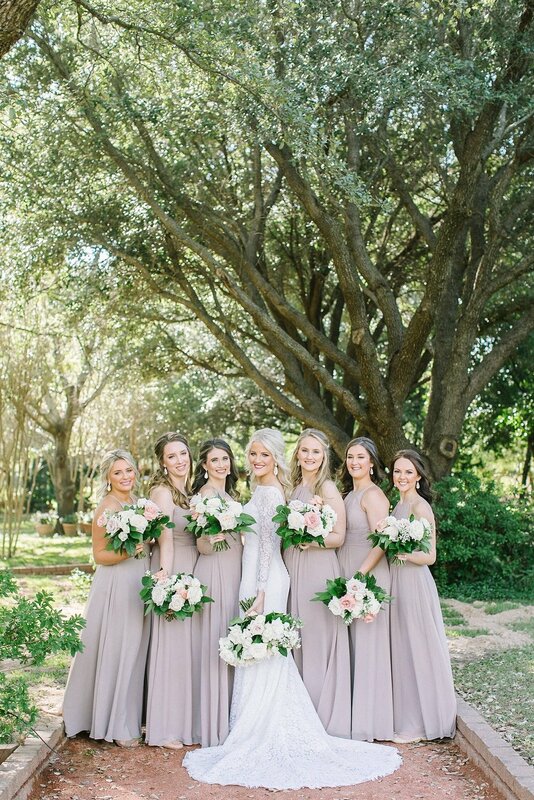 The bridesmaids wore blush bridesmaid dresses and held bridesmaid bouquets mixed with white and blush florals, while the groomsmen wore classic black tuxes. I have to say it was picture perfect, and the ceremony itself was a tear jerker! After the ceremony, as the couple took pictures with their families, the guests headed to the fountain courtyard where Abuelo’s had plenty of appetizers and drinks for guests. Guests then headed to the seating chart where guests found their name on gold and glass shelf that had a glass of champagne with rock candy instead for each guest. It was definitely one of my most stunning seating charts of last year! And each guest got excited about getting a glass of champagne right at the beginning of the reception. The reception was held in the larger tent on the Clark Garden’s property. As guests walked into the reception, they found their seat in the tent filled with a mixture of round and long tables, each with geometric float frame table numbers. At the front of the reception was the head table with a tall white & blush floral, chiffon runner, and floating candles at a variety of heights. All the reception tables had champagne linens; romantic centerpieces is gold vases, gold chargers with blush napkins, and custom menus designed by Brown Fox Creative.